Pneumatic conveying has two distinct methods, Dilute Phase and Dense Phase. Knowing when to apply each method typically involves product testing and a well-experienced individual. Not all materials are alike and not all materials move the same way when transferred through piping. What is dilute phase and dense phase conveying... The answer: They are different modes of how a given material flows through the convey line. That's it you can go home now. Just kidding, there is so much more to know! Watch the video to get the full breakdown between the two pneumatic conveying methods. Debunk some common myths and learn about the "Powers of 2". What is dilute and or dense phase pneumatic conveying? What is the difference between the two conveying methods? 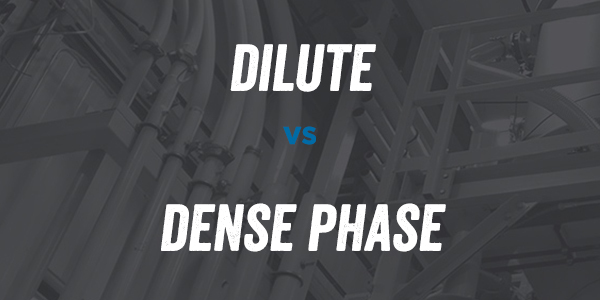 When do you use dilute phase vs dense phase in a pneumatic conveying application? Magnum Systems is the single source for all your bulk material handling needs. Our pneumatic equipment is designed to transport your bulk material from point A to point B. Our conveyors and rotary airlocks are engineered to meet the application, material and site requirements of your process. Since 1960 we have kept lines moving. We are the people and parts that engineer, design, and manufacture bulk conveying and packaging automation systems.